Update for 2019: Deck Stain Failed? Who to Blame? We appreciate your input here at Deckstainhelp.com as we continue to be your go-to source for the latest in deck restoration news and trending topics through 2019. See below for an article about Deck Stain Failure. Deck Stain Failed? Who to Blame, the Stain? Or the Person who Applied the Stain? There is nothing worse than going through the time-consuming process of applying a stain just to see that it is peeling a few months later. This a common query and occurrence for many exterior wood deck owners. You love your garden and deserve to enjoy it. Nobody wants to see an unsightly, peeling deck so today we will be looking at who is the main culprit – the stain or the person who applied it? As we know, excellent preparation of your decking is crucial when you intend to apply a new stain. It is the most prevalent reason that deck stains fail. Applying a water-based stain on top of an oil-based stain or the other way around is one of the major issues that many don’t know exists. Often, stains will simply not stick to other brands so if you are changing then it’s vital you properly remove the old stain. The case could also be that the old stain – which failed by peeling or wearing unevenly – was not fully removed. It’s a bad idea to try and apply a new stain over an old one without first using an effective deck stain stripper. Otherwise, the new coat will be doomed to have the same problems like the one you are removing. Some people erroneously assume that just because a deck is brand new, that it is ready to be stained. This is a rookie mistake. Every deck needs to be correctly prepared for staining whether it’s new or ten years old. Also, when sanding, it’s important to note that exterior decking is not the same as an interior one. When wood is porous, it is more susceptible to absorption so stains are able to thoroughly soak through. A little tip to ensure your wood soaks up the stain is to keep your sandpaper at sixty grit or less. When finished, use a cleaner and wood brightener to clean away the sawdust. Do not over apply. A deck stain will not last any longer if you apply more coatings and in fact, the opposite may happen. Too much stain can film on top of the wood leading to premature failure or peeling. If you’re doing everything right and still having troubles, the problem might not lay with you but with the stain, instead. With so many options at your fingertips, it’s hard to decipher which stains are better or worse quality. Do a little reading into the world of stains and you will quickly see that certain brands have a history of underperforming. We believe that penetrating stains are always the best option. Top 6 Deck Stains. 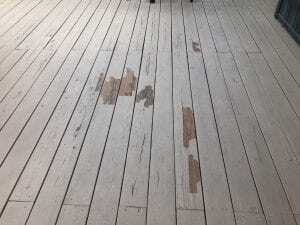 Deck stains that dry/film on the top of the wood and do not penetrate usually have a shorter lifespan, prone to peeling, and don’t last as long. If your deck is well-prepped and you researched the wide array of high quality, long lasting, penetrating stains then you will minimize the risk of having annoying problems in the future. Careful planning and preparation are the keys to success when staining. I will renovate my deck and I saw on Youtube that to prevent “stain blotching” you use a stain conditioner. Is it OK for outdoor to use a stain conditioner before you start deck staining? No that does not work. The stain will not properly soak in and that could cause premature failure. No deck stain manufacturer suggests using a conditioner first. should I use 180 sandpaper instead to get a smooth surface? No. Never sand finer than 60-80 grit. You need the wood porous to accept the stain. Is the fall of the year a bad time to stain a drck?